The topic of today’s post is a motivational quote that is not only falsely attributed to Louisa May Alcott but is sometimes taken out of context. It is very popular on quote websites as well as social media. My findings are as follows. To see how widespread this misquote is, I did a search on Google, and it returned ten pages worth of websites incorrectly attributing this quote to Louisa May Alcott. The irony is that the vast majority of them are quote websites or websites presenting quotes as a major feature. The remaining sites featuring the misquote are mostly blogs and social media. It even rears its ugly head in an article written by a university professor. Obviously, these are not good sources for verified quotes. Never trust a source that does not include details about the quote such as the work in which it is found accompanied by corresponding information such as chapter, act, scene, stanza, line, etc. This particular misquote also appears on a website that is dedicated to creating customized quote paraphernalia such as coffee mugs, posters, awards, etc. The site provides the quote, and the customer chooses the product on which the quote is to appear. Although the quote can be edited by the customer, I would imagine most people would assume the information is correct and leave it as is. One has to wonder how much money is being made on these flawed products. Finally, I noticed that this misquote oddly appears on several anti-bullying websites. One of them actually includes it under the category “Famous Bullying Quotes.” This quote is in fact not about bullying at all. 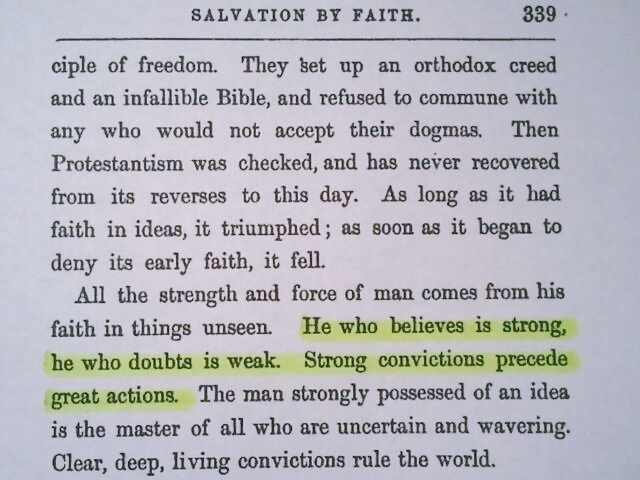 As mentioned earlier, it is from a book written by the theologian James Freeman Clarke titled Common-Sense in Religion: A Series of Essays in a chapter titled “Common-Sense View of Salvation by Faith.” Clearly the subject matter is not bullying. Although the words can be interpreted with an anti-bullying sentiment, to assert they are specifically about bullying is taking the quote out of context. This is a prime example of how a “quote virus” propagates (yes, I made up that term). All it took to spread this infection was one person posting this misquote on one anti-bullying website, and from there it multiplied to other anti-bullying websites. The end result is that there is now a growing number of people in the world who not only believe this is a quote by Louisa May Alcott but also believe it is a famous bullying quote. And this group of poor, lost souls swirling around in the misquote eddy of despair will only continue to grow. ← Look out! Sue Brewton, quotologist at large!